The Pantheon product range offers the right balance between quality and price, optimizing production process to offer long lasting products. The leading principle of our CPG Chrome Contact/Panini Grill design is functionality and ease of use. The Pantheon CPG versatility makes it the essential machine in Schools, Bakeries, Pubs, Restaurants, Fast Food Outlets, Nursing Homes and Hospitals. The Small Single Plate Contact Grill range is completed with tabletop models the Pantheon Chrome Contact Grill (CPG), Pantheon Cast Iron Smooth Contact Grill (CGS1S), Pantheon Cast Iron Ribbed Contact Grill (CGS1R), Pantheon Ceramic Smooth Contact Grill (CCG1S) and Pantheon Ceramic Ribbed/Smooth Contact Grill (CCG1R). The Large Plate Contact Grill range is completed with the tabletop models the Pantheon Cast Iron Large Single Plate Smooth Contact Grill (CGL1S), Pantheon Cast Iron Smooth/Ribbed Contact Grill (CGL1S/R), Pantheon Cast Iron Large Double Plate Smooth Contact Grill (CGL2S), Pantheon Large Single Plate Ribbed Contact Grill (CGS1R) and Pantheon Cast Iron Large Double Plate Ribbed Contact Grill (CGS2R). 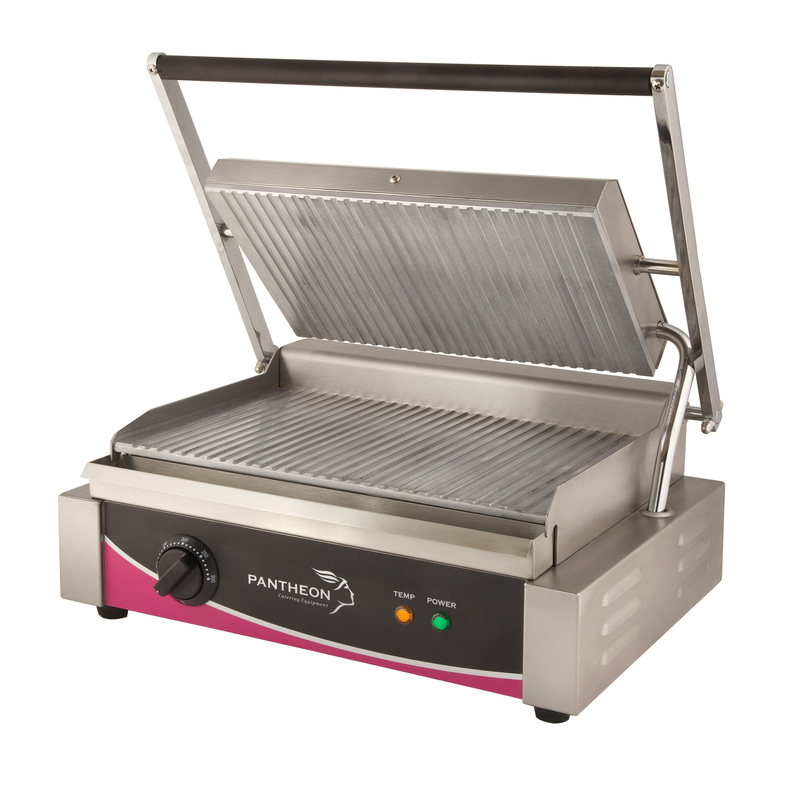 The Pantheon CPG Chrome Contact/Panini Grill’s main feature is the energy efficient elements, easily removed drip try and the counter-balance system for precision cooking.